This what I initially created using Adobe Illustrator. It was my first attempt at using blends. I worked on it for about half of my workday. I wasn’t exactly sure where I was going with it–if I was going to have several fireworks with some copy, one big firework in the middle, or what. 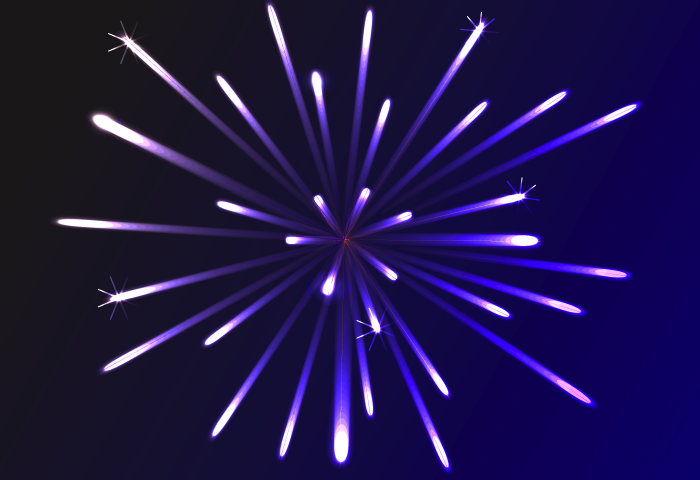 I just knew that I wanted to include fireworks to portray excitement and celebration. Below is the end result. The majority was done in Illustrator, and I did finishing touches in Photoshop. What I realized during this LONG process is the “power” of blend objects! While it may not look like it, the firework “burst” in this image is the same as the one above. I altered the width of the strokes and added a few “sparkles” to the ends of some of the rays, but the biggest difference can be seen in the top, left area of the burst, where the gradient of the background is lighter than the background in the above image, so the the blend objects (the rays) take on the hue of their background and appear lighter. Overall, I worked on this graphic for three days. I created each little dot, star, circle, etc. and manipulated countless layers, opacity levels, blends, glows, you name it, but I was very pleased with the result!